RESEARCH. Stakeholder Interviews. Brand & Business Audit. Competitive Analysis. Consumer Discovery. STRATEGY. Essence. Positioning. Values. Architecture. IDENTITY. Naming & Tagline. Logo Design. Stationery. Brand Guidelines. EXPRESSION. Collateral. Integrated Communications. Video. DIGITAL. Web Design & Build. Online & Social Media. 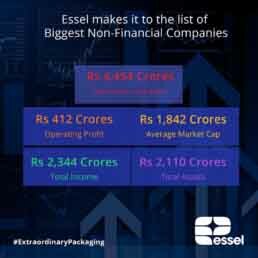 Essel Propack, part of the USD 2.4 billion Essel Group, is a global tube-packaging company and the world’s largest producer of laminated plastic tubes. The company caters to several customer segments with a focus on Oral Care, Beauty & Cosmetics, Pharma & Health, Food and Home. With the vision to be a long-term leader and pioneer in sustainable packaging solutions for the world, Essel Propack employs over 2,600 people representing 25 different nationalities, and functions through 25 state-of-the-art facilities across 12 countries. While Essel Propack had risen quickly to become a global market leader, like many B2B businesses it had neglected to focus on brand and branding. Over time this emerged as a weakness and liability to the business – limiting the company’s ability to project itself as a market leader and affecting its new customer acquisition rate. As such Essel was in need of an exhaustive 360 degree rebrand to elevate its profile and place it on the pedestal it deserved to stand on. We went to work to create a world-class branding programme for Essel Propack. Relying on extensive research as the backbone for all future deliverables, we interviewed over 100 employees and 25 customers across geographies and functions to understand internal and external perceptions of the brand. Furthermore, we also studied 30+ competitors to understand their state-of-brand. The research findings informed the creation of a relevant and differentiated brand positioning idea articulated as “Extraordinary Packaging”. We followed this up with the creation of a compelling logo built on rigorous design strategy – comprised of five ‘petals’, coming together to form the letter ‘E’. Each petal is representative of a unique segment that the company caters to. The entire brand philosophy and all brand assets were captured in detailed brand guidelines, which were circulated globally. Next we designed and built a comprehensive global website that works seamlessly on all devices, translated across 10 languages, to reflect the global and diverse nature of the company. We also conceived of and produced a corporate video to serve as an audio-visual narrative of the Essel Propack story. Post the rebrand we were entrusted with a primary role in the on-going communication of brand Essel Propack through the creation and management of its social presence across Facebook, LinkedIn, Twitter and YouTube. Essel Propack’s rebrand was a blockbuster success. The rebrand was unveiled globally to internal stakeholders during a quarterly town-hall style meeting, following which it was officially made available to external partners and investors through various channels and the media. The organization has grown quarter-on-quarter, with the share price appreciating more than 50% in the first 12 months post the rebrand.